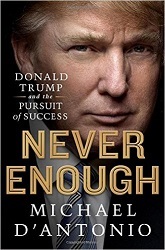 Click here for 25 full quotes from Donald Trump in the book Never Enough, by Michael D'Antonio. This book is a solid biography of Donald Trump, written in anticipation of the 2016 presidential race. But because Trump was never a serious politician prior to 2015, there's just not a lot of political detail here. It does include a thoroughly-researched history of Trump's business dealings as well as his personal life. Those last two do have SOME political implications (see our excerpts) but the rest provide much more background than most 2016 voters will care about. Nevertheless, this is the first serious political biography of Trump, and deserves to be read by pro-Trump voters and anti-Trump voters. Perhaps skimming the sections above -- or just reading our excerpts. Sought NYC deal with $4M property tax break. Well-educated blacks have advantage over whites. 1989 full-page newspaper ads: "Bring Back the Death Penalty". 1991: Illicit drugs should be decriminalized. Wind energy projects are industrial monstrosities. Offered to oversee response to 2010 Gulf of Mexico oil spill. Offered himself as Cold War nuclear-arms-treaty negotiator. Ebola virus in America is Obama's fault. Stockpile treatments against future pandemics & bioterrorism. 1965: opposed Vietnam War but never joined protests. 1969: Drew high draft lottery number, and never got drafted. Vietnam war was mistake; I'm grateful that I stayed civilian. Bush should have caught Osama bin Laden. Opposed to casinos on Indian reservations. A germophobe: constantly washes hands; dislikes handshakes. 2011: Obama's birth certificate is hiding something. Birtherism: demanded that Obama produce birth certificate. OpEd: Obama's grandmother never said he was born in Kenya. OpEd: Obama doesn't have the psychology of a winner. OpEd: Lifelong dance of mutual manipulation with the press. Sent to military academy because of childhood rebelliousness. I've always been rebellious and very set in my ways. OpEd: One-time wealth tax could cause stock market collapse. Sought to exclude welfare recipients from his residences.